JayWalk - All Your Xmms Are Belong To Me: Most Expensive Mobile Phone Bill Ever! I was away since mid-January when I went to Las Vegas for exhibition only to come back immediately to Hong Kong for a night's layover before rushing back to Singapore for the Ch1nese New Year. And it was in Singapore that I spent two week blissfully at home. Problem is that work carries on wherever you are and my Ch1na mobile phone was actively in service. I guess the real problem was that I made the mistake of now downloading the maps via PC and instead relying on network to download the necessary maps as I also made my way to Kuala Lumpur and back during this period. I guess I learned the lesson the hard way where I was downloading massive kb of map data. To further aggravate the situation, I was signed on to the various 3G network which was lagi more expensive. At the end of the day, my January bill was RMB 5800. 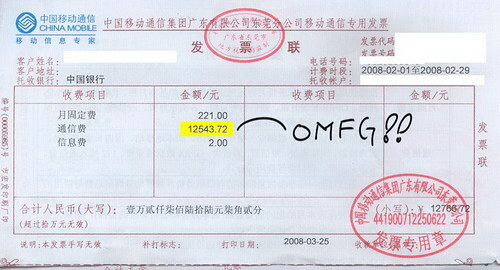 Just when I thought the worst if over, I was hit with a RMB 12,000 bill. Looks like it's going to be another as a Diamond Member of the Ch1na Mobile club. 1. Load your maps via PC ahead of using. Do not download the map data via 3G/GPRS as the data flow maybe massive during usage and especially more expensive if you are roaming overseas. 2. With reference to (1), turn off download via data packet in the application's setup menu. and where is my flower!!!? Is there any benefits to being a Diamond Member?? Aloe: Off hand, I know that I dun have to queue at the customer service centre. I have access to the VIP section where the customer service manager would attend to me personally. I also have a customer service manager assign to me during the year where I can call his mobile phone direct to request for assistance. The best benefit is the airport for domestic flights where a staff will process the check-in for me i.e. I give her my passport, luggage, air tickets and then she will check in for me, get my boarding pass while I sip coffee at the lounge. Thereafter, a golf buggy will take me to security clearance where I will clear security via the staff channel i.e. no queue. After clearance, another golf buggy at the other end will take me to the lounge or directly to the gate to wait for departure. YOU ARE AN HERO!!! CONGRATURATION! cowboycaleb: I thought you were going to say "A winnar ish you!". Mistress Grace: Thanks for rubbing it in ah! OMG! that is really a lot. Alexander: Yeah man..... expensive lesson learnt!!! Ed, Edd & Eddy: If it were pron, it'd be cheaper! dammit!! This is probably the annum salary of an average spitlander, loh. This one, your company pay, or you pay? JY: Welcome to the blog. My company pay or I pay is the same thing. Hmmm.. should i rub it in too?? This is MORE than my monthly salary and probably also more than most ppl in Singapore.. like that uncle tending to the toilet everyday.. auntie selling vegs.. sighz..
Chocolate Gal: Walau..... thanks ah!! George: Welcome to the blog! Actually there is another RMB 8000 spilled over to the following month's bill but you still win on account of the fact that yours is, which I presume, is AUD.